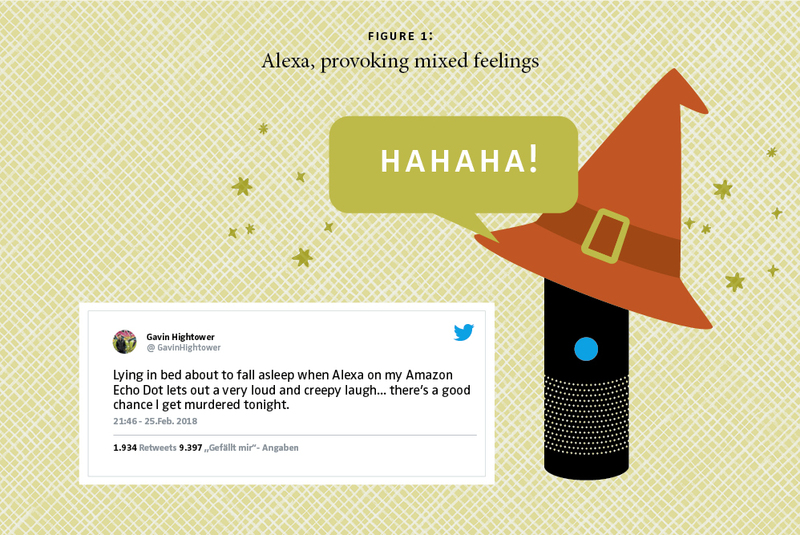 In March 2018, headlines drew attention to user reactions when their Amazon Alexa-enabled devices started emitting what sounded like strange, unprompted, “witch-like” laughter. Many users had responses like the one reflected in the tweet in Figure 1. Apparently, reactions like these are common even among those who have considerable experience with Alexa-enabled devices. Though new IoT products may be deeply engaging, even the consumers who love them and use them may also be persistently wary of them. IoT marketers can learn valuable lessons from these weird consumer associations and the mixed feelings they entail. In general, sociological consumer research into users’ relationships with technologies suggests that there are deep cultural roots to such paradoxical reactions. Marketers need to anticipate and respond to the conflicting feelings that many consumers have even toward technologies they own and use. But how can IoT marketers avoid or handle these paradoxical responses and foster consumer trust? Turns out the answer lies in storytelling. Consumers’ perceptions of technology are less matters of product attributes and concrete statistical evidence and more of captivating stories and myths. From this sociological perspective, managers of IoT can instill consumer trust when they tell highly emotional stories about the technologically empowered self, home, family or society. The key benefit of this approach is that storytelling-based IoT marketing allows consumers to forge strong and enduring emotional bonds with IoT and, in many cases, to develop loyalty beyond belief. Consumers’ perceptions of technology are less matters of product attributes and concrete statistical evidence and more of captivating stories and myths. However, stories aren’t always positive, such as the reactions to Alexa’s laughter. Doppelgänger brand images – negative stories and meanings about a technology that are circulated in popular culture – can be dangerous and harmful to a brand or a new technology. By drawing on deeply rooted mythic archetypes about technology such as the popular Frankenstein tale or the myth of enslavement through technology, or, lately, Alexa the witch, doppelgängers can undermine emotional consumer-technology bonds and provoke technology distrust and rejection. The dark doppelgänger images for a given technology can be generated by the mainstream media, by internet trolls or by concerned consumers. Sometimes marketers contribute, unintentionally, to the rise of their own technology’s doppelgänger (see the Amazon Key Story in Box 1). BOX 1: Stranger Danger or Welcome Stranger? Trust me … I’m Amazon! Stranger danger! For most of us, hearing those two words together is enough to conjure up an image of a parent or teacher warning us not to trust people we don’t know. Based on this logic, Amazon introduced Amazon Key last year in 37 metropolitan areas in the US. In a nutshell, Amazon promoted this initiative on the basis that a well-functioning IoT camera and smart lock will give consumers extra convenience while also ensuring safety. But according to a recent survey by technology news website Recode, even among Amazon Prime subscribers, over half of respondents would “definitely not” buy Amazon Key. It seems people simply aren’t open to the idea of allowing a stranger to enter their own home when they’re not around. Trust me … I’m Airbnb! But wait… hasn’t someone else already proven that this isn’t true? Trusting strangers enough to let them into your home is the pillar upon which the immensely successful hospitality platform Airbnb was founded. Not so long ago, it would have been unfathomable that almost one million people would either be staying in someone else’s home or be welcoming someone into their home each and every night. Now, this is quite common and considered normal. Amazon chose a product-based approach, while Airbnb is dependent on selling trust. By promoting cloud cameras and smart locks as surveillance and security tools, Amazon Key largely retells ingrained “stranger danger” stories. Airbnb, in turn, approaches IoT as a sociological instrument – a means for rewriting the story of the home as a social space. Or as Airbnb co-founder Joe Gebbia put it, “maybe the people that my childhood taught me to label as strangers were actually friends waiting to be discovered.” Airbnb approaches the home security dilemma from the stance that people are generally trustworthy, and everything on its website is geared towards this positive, market-enabling stance. Sure, if something does go wrong, homeowners and renters know they have back-office guarantees protecting them, but these are in the background for a reason – Airbnb wants people to know that you are a trustworthy human being, and so too are most of the people in the world. Designing an experience in which customers view delivery people not as strangers but as decent human beings is something Amazon might want to learn from Airbnb. Even more important than technology, trust will be the key to opening doors for Amazon. IoT marketers can use the storytelling approach to their advantage. Based on our research on the role of stories in the perception of technologies, we have several recommendations for IoT marketing. Powerful doppelgängers are likely to spring up for almost any new technology. Consider the intense, but conflicting, cultural images that have emerged for smart technologies like Amazon Key, for instance. One image sees the Amazon Key as the ultimate enabler for consumers who want to welcome Airbnb guests, dog walkers or delivery people into their homes. The other positions it as a dangerous threat to consumers’ safety and security, a virtual invitation to “stranger danger.” Regardless of its source, marketers need to understand the nature of the doppelgänger images that may be circulating for their technologies. The doppelgängers can be regarded as diagnostic tools to better understand how consumers think about and experience their IoT solutions. Apple, for instance, has developed an elaborate doppelgänger radar that monitors social media in real time for negative stories about their products. Some conflicting images of a technology are unique to particular consumer segments, while others are widely shared even among those who are considering a purchase or who already own the technology. It’s critical that marketers do not assume that negative images will remain localized to people outside their target market. Even those who are considering a purchase or who already own an IoT technology can be affected by both its enabling and its threatening images. Clearly, marketing messaging is critical, as the case of the Amazon Key referred to in the Box illustrates. However, rhetoric alone won’t keep the doppelgänger at bay. IoT marketers need to consider the full range of consumers’ experiences with their technology in order to keep the threatening images of their technologies from overwhelming the enabling ones. Users feeling disturbed by the creepy laughter coming from Amazon Alexa illustrate that consumers’ interactions with the product itself also have the potential to confirm their fears about the threats it poses. Only once marketers know the triggers that elicit doppelgänger images can they hope to ameliorate them. Technology marketers need to be aware that they are telling stories even if they think they aren’t. Amazon triggered “stranger danger” perceptions simply by concentrating on security-related product features. Marketers need to be aware of the deeper meanings and of popular myths and stories of their messages. Based on such insights, they can manage the stories and meanings to build consumer trust, or they can apply the more elaborate doppelgänger management technique of inverting a doppelgänger’s negative meanings. Consider how Airbnb has successfully combatted stranger-danger perceptions by presenting itself as a promoter of neighborhood community. While doppelgänger images can be bad or freaky and significantly undermine emotional consumer-technology bonds, they can also point marketers to negative perceptions consumers might have and the underlying cultural values that they see at stake. When marketers read doppelgänger stories like sociologists do, they can learn a great deal about consumers’ enduring quests for important cultural values such as a warm and caring home, a loving family, or a welcoming neighborhood. From this diagnostic standpoint, doppelgänger narratives are valuable raw ingredients from which marketers can cull new, more captivating IoT stories that nurture consumer adoption, trust and happiness. As long as they are diagnosed, understood and addressed or inverted in the entire technology experience, even bad and freaky stories can be good stories. Eileen Fischer, Professor of Marketing and the Max and Anne Tanenbaum Chair of Entrepreneurship and Family Enterprise, Schulich School of Business, York University. Toronto, Canada.